Damn. That was hard. We all knew it would be. But it had to be done, right? We need goals in life. Something to push us beyond our comfort zone. And let me tell you, that last 34 miles were uncomfortable alright. A little history. Last year was the inaugural Issaquah Alps 100K starting at Mt Si Trailhead and finishing at Cougar Mountain. It took us 18 hours. I can't remember how much elevation gain there was, but it was a lot. 18,000? After that effort, it was only appropriate to up the ante and make it even harder. George Orozco, our route creating brainchild, put together a 100 mile point to point run that initially included other peaks such as Granite Mountain and Bandera. He toned it down but still included two very tough early peaks, Mailbox and Teneriffe. 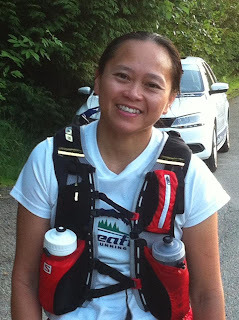 The first attempt at this Issaquah Alps 100 Mile endurance run was supposed to happen on May 2. It also included a 100K, which all but 3 runners participated in. Me, Deby Kumasaka, and George planned to stick together for the whole thing. But there was a glitch. A couple days before the event, it rained cats and dogs at sea level while dumping several feet of snow in the mountains. The weather on event day was beautiful and a little warm. At 2000ft, we hit snow on Mailbox. 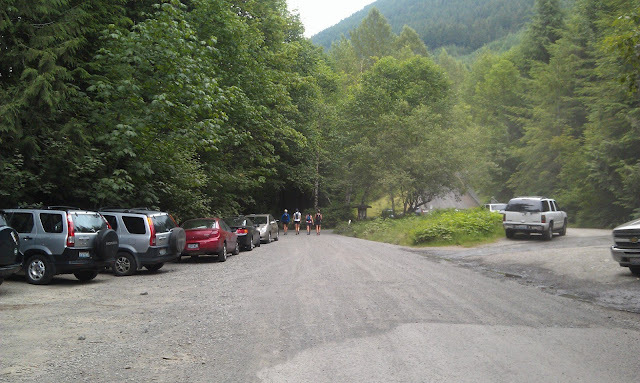 Long story short, the snow sapped everyone's energy and everyone stopped at 50K at Little Si Trailhead. John Barrickman was prepared to continue, but by the time he arrived at the Little Si trailhead, everything was coming apart. Deby, me, and George tried to salvage as much as we could by being shuttled to Tiger and running the last 50K+ miles of the run but stopped after 13 miles, for 42 total. The next day, Deby messaged me and was having DNFer's remorse. We agreed to try the 100 again over the July 4th weekend, since we both already had requested the time off work. Fast forward to July 4. The week leading up to this day had record temps in the 90s and freaked us out. 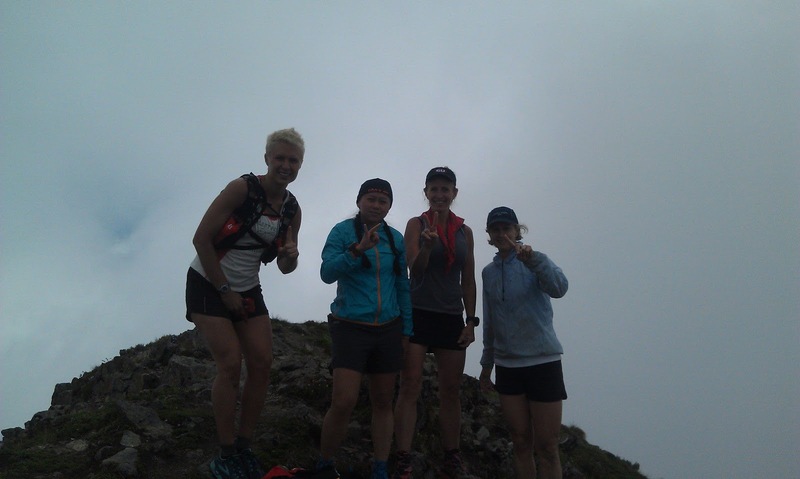 Deby just returned from crewing the second hottest Western States on record 4 days earlier. She no doubt was dehydrated and tired from that effort, where she crewed and then paced Jonathon Shark for 40 miles of the race. We both had a stressful work day before our start. Still, spirits were high and we had good friends who were going to help us throughout. George picked Deby and I up at the High Point trailhead at Tiger at 5:45am. Deby's son Myc woke up early to drop her off and would return later that night to crew us. 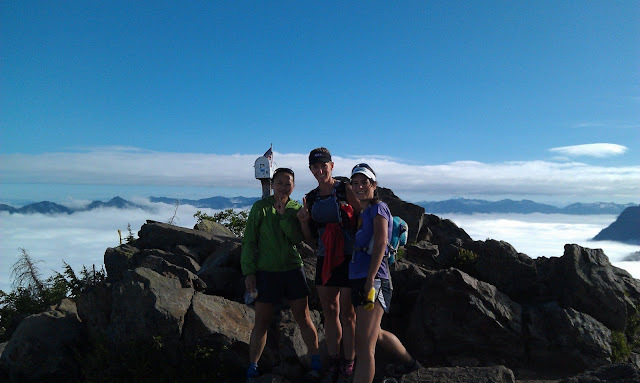 Stacy Nievweija joined us for the first climb up Mailbox peak along with George. The weather was perfect, not too warm yet. There was cloud cover, so the sun was not beating down on us. 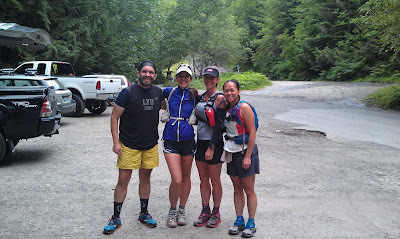 A few weeks before this run, George and I had run the first 50K with Jaime Clark. Actually, it turned out to be 33 miles, which is exactly what I got again during the event. It took us 13.5 hours then and we were all starving well before we finished. We realized that all of us needed more solid foods to recover from the hard effort of the climbs. I diligently prepared a bunch of solid food that I felt would be somewhat appetizing and tried to eat something solid every 2 hours. This worked very well for me and I never got too low on sugar or felt nauseated. Even if I didn't want to eat real food, I would just force it down and took care of that empty feeling in my stomach before it got too bad. I was able to hold off on needing gels for the most part until later in the run. I estimated that it would take us about 1:45 to 1:50 to reach the peak, and I was dead on. 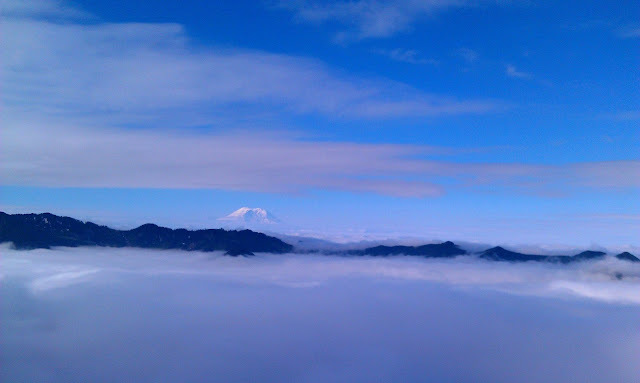 We were above the clouds and could see Mt. Rainier in the distance. We took a summit picture and planned on doing that every time we hit a summit counting them with our fingers. I had some leftover Dim Sum and half a sandwich before we descended. It was warming up and the humidity was moderate. We ran into Jonathon and Linh Shark on the way down. Jonathon looked like he was already recovered from Western. They wanted to keep going and get the views at the top, so we bid them farewell. There were a ton of people going up as we were heading down. The parking lot was packed when we got back. At the bottom of Mailbox, Jess Mullen and Anita Schlitz were waiting for us. 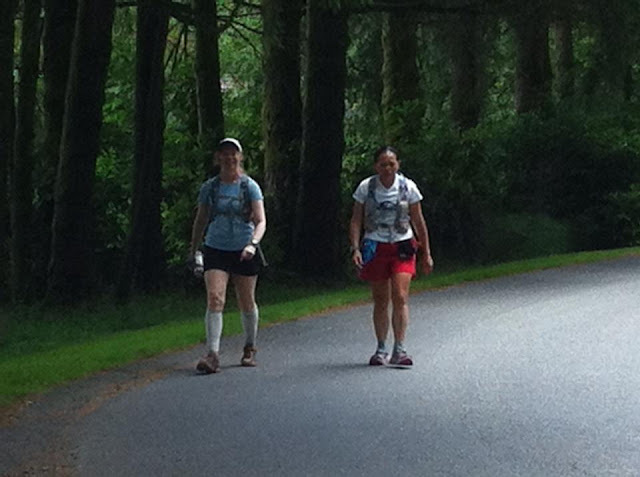 Jess was planning on running 100K with us from that point on and Anita 20+ miles. That was about a 10 minute stop as we waited for George and Stacey to arrive. Jess and Anita's enthusiasm rubbed off on us and we had a great time chatting and catching up. Anita had just finished Bighorn and really liked the 100 mile distance. We ran up the Granite Creek trail for 2.5 miles to an unmarked connector trail that spit us out on the Middle Fork road. This section was fun with rolling and runnable trails. We crossed the Snoqualmie River and took another trail that led us to the CCC service road. I had been dreading this road part for most of the morning, but it flew by having company along. I continued eating solid foods like a hot dog, beef and bean burrito, and perogies. George was waiting for us at the Teneriffe trailhead and planned on joining us for the difficult climb up. We drank some coke, had some watermelon, and loaded up on food and water since it would be about 8 hours until our next aid. I switched from my smaller Gregory pack to my Salomon pack, which can hold more and is my pack of choice for long training runs. Deby and I packed our Steri pens in case we ran out of water. I brought along 60 oz to start. This was a 10 minute stop. The climb up Teneriffe has no easy part, except for the 1 mile road section up to the actual trail. We took the old, less maintained trail that connected up with the main trail in a mile. This kept us close to the water and allowed us to cool down by dipping our hats or bandanas. There were a decent amount of people on the trail but they usually stop at the falls and very few hike up to the summit. Once you reach the falls, you basically just go straight up and there are about 10 false summits. There is some scrambling involved and is exposed in some spots. We did see a few hardy people. No snow in sight. After what seemed like an eternity, we reached the summit and sat down for lunch. I had Chow Mein and a burrito. We took our summit picture. 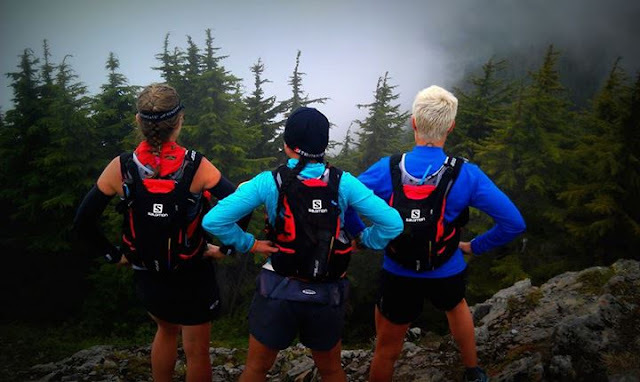 I wanted a picture of Jess, me, and Deby with our Salomon packs on. We all had the same packs. It turned out great! The descent is not the same as the trail that we came up. We took the trail that connects to the service road, about a mile away, then it's 4 miles down to the connector trail to Big Si with fairly rough footing. On our way down, we picked up two kids who looked like high school teenagers or early college aged. They were lost and we directed them down the road. Their car was at the Teneriffe trailhead. They certainly had a longer day than planned. Deby and I loaded up on more water on the way down. Good thing because Roaring creek was completely dry. Anita left us and headed down with George to the Teneriffe trailhead since her boyfriend was expecting her down by 4pm and he was cooking steaks for the 4th. 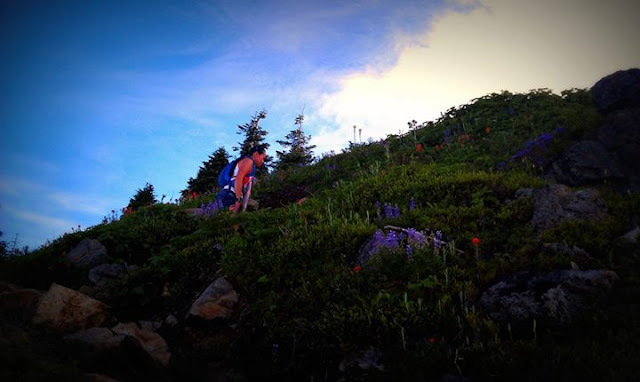 We took the connector trail to Big Si and took the upper Talus loop trail instead of the lower one. The lower one would spit us out at the one mile mark on the Mt Si trail whereas the upper trail would spit us out at 1.7 miles. I knew that even though this was the shorter route, we would still end up with 33 miles at Little Si trailhead, which was 2 miles longer than what was predicted on George's planned route. The trail was not crowded as most people had already completed their hike for the day. It was still hot and muggy. We were all very sticky. We summited our 3rd peak and took a quick picture because the mosquitos were swarming like crazy. I called Ken and let him know our ETA to Little Si trailhead, which I told him would be 6:30 to 7pm. He was bringing the pizza. I continued with the solid food, eating a hot dog and garlic bread. We took the Old Si trail down towards Little Si trail. It is a steep and at times very technical descent for 2.5 miles. We arrived at the junction to Little Si summit, which was 1.7 miles away. There was a nice creek where we soaked our bandanas before the gradual ascent to Little Si. It was steep in some spots and at this point, we were already tired and hungry. We ran into Takao Suzuki and his family. It was nice to see a familiar face. He had his small point and shoot camera, not his fancy camera. We arrived at Little Si Trailhead about one hour ahead of schedule a little after 7pm or about 12 hours. Having no snow made a huge difference. I felt so much better at this point than when we did it in May with the snow and also better than when I ran it in training with George and Jaime Clark. I had kept up on the food and water and my body was thanking me for it. Ken had brought pizza and everyone had some. I drank some Coke and a Frappucino and switched to my Ultimate pack for the short 6 mile section on the Rails to Trails Snoqualmie Valley trail. The change in pack felt good. It was incredibly light. I was starting to have chafing on my shoulders from wearing a tank top, so I also changed into a new sports bra and short sleeve shirt. This felt nice. Maylon Hanold started crewing us from this point and relieved George. Jeff Forister also joined us here to pace us to High Point at Tiger. I kissed Ken good night and told him I would call him when we got to High Point, I expected no earlier than 6am the next morning. This was a 20 minute stop. It did not take us long to get to Rattlesnake Lake. In fact, Maylon had gone to the store to grab a few more things and had just arrived when we got there. Deby's son Myc was there also. I switched back to my Salomon pack because it was going to be about 5 hours before we saw them again and I grabbed my poles in case we had to cross the Raging River. I was still eating solid food but was adding more gels and gummi chews, which were easier to swallow. I had brushed my teeth at mile 25 and continued to do so every 25 miles. It saved my teeth in the end. I had very little sensitivity, which has been a big problem for me in the past. Just water and a toothbrush. No need to bring toothpaste. We all packed our headlamps and started the hike up to the ledge. We were off after another 10 minute stop. People were coming down as it got dark and asked if we were heading up to enjoy the fireworks. Well, kind of. We were just really passing through. I enjoyed hiking up at dusk and tried to keep my light off until I really needed it. I was able to hold off the longest. Jeff was leading and was setting a mean pace. Deby looked like she was having no trouble following him and Jess was having no problems keeping up. I was able to keep up but actually tried to keep my distance. I felt we were going a little fast and eventually asked Jeff to tone it down. I didn't think we would be able to hold that pace for very long. We arrived at the ridge and looked down on the valley. Multiple fireworks shows were going on and we could see them all. They seemed so small from above. It was pretty cool. We hiked and ran along the ridge catching glimpses but mostly just hearing the pop-pop of the explosions. We arrived at the first summit along the ridge 4.5 miles from the Lake and took a picture. We did not take another picture at the next summit before descending. Deby had started to feel bad with nausea. She was burping constantly. I had Tums back at the car. Jess had some Prilosec. She thought it would pass. We got a break from the climbing and started descending gradually. It seemed like it took forever but we finally arrived at the point where we were going to leave the Rattlesnake ridge and head towards Tiger. We bushwacked down to a service road and followed that until we arrived at a side trail that hooked us up to the powerline trail. After passing the power station, we had to walk over half a mile on the worse surface you can imagine-large loose rocks on the road. Our feet were getting a beating. We descended to the river and shined our light on the water. It was at the same level as when Deby and I scoped out the route 3 weeks earlier, which came up to my crotch. No one wanted to get their feet wet, so we bushwacked up the Highway 18. Jeff had found a much easier way up than the last time he and I had done it about a year ago. We ran on the road over the river for less than 1/4 mile and made it across without being passed by a car at 2am. Just on the other side of the river was Maylon and Myc. They had a nice set up for us with lights, music, and all our gear laid out. Deby had some Tums and a cup-o-noodle. At some point she had some Perrier and asked for 7-up. I had some more Chow Mein. I had brought my heavy fleece robe to keep me warm during our stops. I drank another Frap but had to keep it at a minimum since it made me pee more. Although my feet were hurting, I didn't want to change shoes since we would be getting our feet wet soon at a creek crossing. This stop was a little longer-about 15-20 minutes. We crossed the creek and started the steep hike up towards Tiger. This is when we started to notice some overgrowth on the trail and this would be a recurring theme for the rest of the run. I started to feel strong again. It seems like the Fraps were really helping. About one mile on the service road then back on trails. The run on NW Timber trail was relatively clear and fun. We arrived at the TMT road and ran down the short section to the parking at the Tiger Summit off Hwy 18. There again were Maylon and Myc, all set up for us. They were parked under a large light and it was nice that we could see everything without out headlamps. Another 15 minutes here. We had a 3.5 mile hike up the service road to the summit of East Tiger. I chatted with Jeff while Jess chatted with Deby. It was nice at this point to have an easy surface to travel on and zone out. We were able to ditch our headlamps after a mile up the road. The morning was cool and it felt great. I had been feeling hot all day the first day and also into the evening. At this point, Deby was feeling like she needed to vomit but couldn't. So she just remained nauseated. The Perrier and 7-up didn't help. I learned from other runners that this feeling was the result of low blood sugar so I suggested she just needed to eat some gels if she could. I had never had this problem myself, so I couldn't give her any advice from personal experience. She was sucking on Clif Bloks which was a good idea. She also needed to slow down and run her own pace. As I ran, I stopped to make sure she was fine and still with us. We finally made it to our next summit on East Tiger. We headed down the road and connected up with the East Tiger Trail. This was all new and added a mile compared to the old route. It was disheartening but at least the trail was wide and runnable. Deby also was dealing with diarrhea at this point, having stopped about 3 or 4 times already. The poor girl! The newer trail was clear but soon enough, we were back on the old trail which was overgrown. Jeff led most of the way and endured the constant spiderwebs on our way to High Point. After 25 hours and 68 miles, we arrived at the cars. My Garmin showed 27,000+ feet elevation gain, but that might have been a little over. Jess was pleased to have achieved 100K without Mailbox and was thankful that she did not have to go up and down West Tiger 3 to get her 100K. Deby had decided she needed to rest if she was to continue. She had been feeling dizzy for a long time. Maylon and I talked about it afterwards and both feel that she had not recovered from her hot Western States crewing and pacing. It seemed obvious to Ken that this was the case, but us ultrarunners tend to feel invincible. Jeff was going to run back to his house, which was 3 miles away. Tracy Brown was there to pace me the last 34 miles. (I had already decided that because of the extra mileage at this point that I would shorten the number of miles on Squak on the way over to Cougar). Tracy had brought me some McDonald's greasy and salty food at my request. I had half a ham and cheese breakfast sandwich, some hashbrowns, and an apple pie. The apple pie went down the easiest. I changed my sports bra, shirt, underwear, and shorts. I grabbed a fresh bandana and changed shoes and socks. I planned on finishing in my Hokas. I called Ken and let him know where I was. Deby was going to rest and I figured she would join me again after I came down from Tiger on my way over to Squak. Maylon was done crewing and needed to get somewhere. She was awesome. I said good bye to Jess and Jeff and headed off with Tracy. Almost immediately I felt crappy. I wasn't sure if I stopped for too long (that took over 30 minutes) of if it was just the cumulative miles and hours. All I knew was that I was struggling. It donned on me later that it was all the above. I was having trouble staying awake, so I took one GU Tri-Berry gel with caffeine and did not have anymore problems. It was also the steep climb up Tiger. It was sapping my energy. Finally, it was the heat and humidity, which at this point in the run I was not able to control my body temperature and it was doing whatever the ambient temp was doing, which was warm and muggy. I continued to force solid foods but mixed in gels and gummi bears. Finally, we reached Tiger 3. No one was up there. This was Friday, July 5th, still a work day for most. A quick jaunt over to Tiger 2 and Tiger 1. Thankfully, the hike up 3,2, and 1 as well as down Upper Bootleg towards the Christmas tree were clear. But as soon as you passed the Christmas tree to run on the Paw Print connector trail, it was very overgrown. Nettles taller than me, salmon berry making it difficult to see the trail, and anything else trying to grab you spanned the entire distance to the Paw Print bathrooms. It took me a long time to get through this. Strange thing was that it was mowed down on the other side of the road before the TMT trail. So basically, I was running in hell followed by running in heaven. For the most part, the TMT trail was in good shape with a few overgrown areas. This is where we ran into George, who started at the High School trailhead and ran back towards us. He was nice enough to clear the spiderwebs. He also gave me his last Rice Krispy treat that Jess had made. He figured I needed it more. And I did. He ran with us for 1.5 miles before I told him to go ahead while I fixed my laces. I was disappointed that my feet were not feeling better in the Hokas. Basically, my feet had gotten very swollen and the Hokas felt too small. I knew that I needed to change back out of them. We left the TMT and ran down the One View trail. I enjoyed this part. Then it was down the Poo Poo point trail, which starts out nice and soft but then when it starts to flatten out for a bit, it became technical and rocky and turned my feet into hamburger. I was ready to get off this mountain. We crossed over Front Street and walked down Sycamore Lane. Deby and Myc and gotten worried about us. It took longer than I had told them. I changed back into my Salomon's but a newer pair. This was a good idea, because they felt a lot better. I was dreading the grind up Squak and my body was still overheating. I thanked them profusely as we headed off. This was a 10 minute stop. Tracy was basically having a conversation with herself because I was not talking much. She knew I was too tired to reply and did not take it personally. We headed up the steep road to the East Ridge trail, which is 2 miles of unrelenting steepness. Fortunately, it was clear of overgrowth. I overheated again but pressed on. Next was the East Side trail, 2 miles of mostly overgrown trail that sapped my energy. It did not get much better on the run down the West Side Trail to SR 900. The trail is steep here and technical. Without being able to see much of the trail because of overgrowth, I had to just hike fast instead of run. My feet didn't hurt as much as before when I had my Hokas, but my shins were really sore from pointing my toes up to avoid catching them on anything. My left IT band at the hip was also talking to me and made it feel as if my hip was going to pop out. I knew it wouldn't, but it bothered me with each stride down. All of this was eating into my resolve and all I could think of was the steep climb up the connector trail on Cougar and the 8.3 miles before coming back to SR 900. Deby and Myc were there with smiles and encouragement. I told them that I wanted to get back in 2.5 hours and was not far off. I wanted to finish as fast as possible so they could go home instead of spending their evening crewing me. I wet my bandana on the way up the connector trail to get my body temp down and then just moved, moved, moved. I ran most of the trails, only power hiking the really steep stuff. But at mile 90, I was pushing so hard and all I could think about was that I had 12 miles to go. I just started crying. Tracy had just come up and announced she was doing a wellness check. Oops. Not doing so well. She backed off and gave me some space. I let it out then regrouped. I needed that. We made better time down than I expected. I thought I was going to have to tip toe down to SR 900 but was able to run it. When I got there, I told Deby that I was just going to pack everything I needed for the last 8.5 mile push instead of seeing her in 5.4 miles on Sycamore lane. I didn't want to spend time stopping again. She was like, "Are you sure?" Concerned as always. I told her I was moving better and Tracy confirmed it. 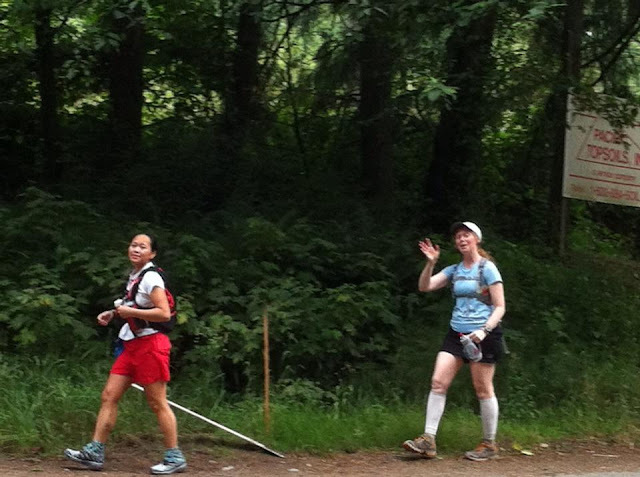 We left them for the last time before the finish and hoped to see them in less than 3 hours. I was trying to relish that last steep climb up the West side trail but the overgrowth killed that vibe. I called Ken and let him know I was closing in on the finish. I couldn't talk long while climbing uphill. Tracy was leading and that helped. It was disheartening to see her walk while I tried to keep up a jogging pace, but I was making decent forward motion. Finally, we were on our way down the East Ridge trail, which seemed to take forever. We hit the road and walked/ran. My feet were very sensitive on the hard surface and I waddled even more. We hit the High School trail. I ran counting to 25 then walked a bit and repeated. One more short climb up towards Brink trail then it was flat or rolling until the end. We took Ruth's Big Tree spur before running on the final trail on Swamp Trail. Down the road to the lower parking lot to the FINISH! That was where I stopped my watch. We walked the quarter mile to where Deby was parked, closer to the freeway. She stepped out, took a picture of me, and gave me a hug. "You are stubborn, Van." Loved rereading this! Reminds me that I still have a few summits left on my bucket list. As Ras is out there now, doing this, I had to come back and re-read your report. Epic! Congrats! Amazing accomplishment and well written report. Any chance the route is mapped somewhere or there is a gps download? I read about this in Trail Running magazine. Might like to try it?? ?